Chicken pakoras are a great first course for dinner and are a very moreish canapé for a drinks reception. These golden nuggets of crisp and spicy batter then goes into the softness of the chicken. They can be enjoyed with a variation of dips and are always a firm favourite at my dinner parties. 1Add the salt, chilli powder, coriander powder, turmeric, cumin powder, ginger and garlic paste to a bowl, then mix well. 2Add the chicken and coat it with all the spices. Marinade the chicken for 30 minutes to 2 hours in the refrigerator. 3Beat the egg and blend it with the mixture. 4Coat all the chicken and spices with all of the gram flour, then add the water and mix well again. The thick batter will cling to the chicken well. 5Heat the oil to 170°C. Add the chicken pieces one by one into the hot oil. Please be very careful and not burn yourself. 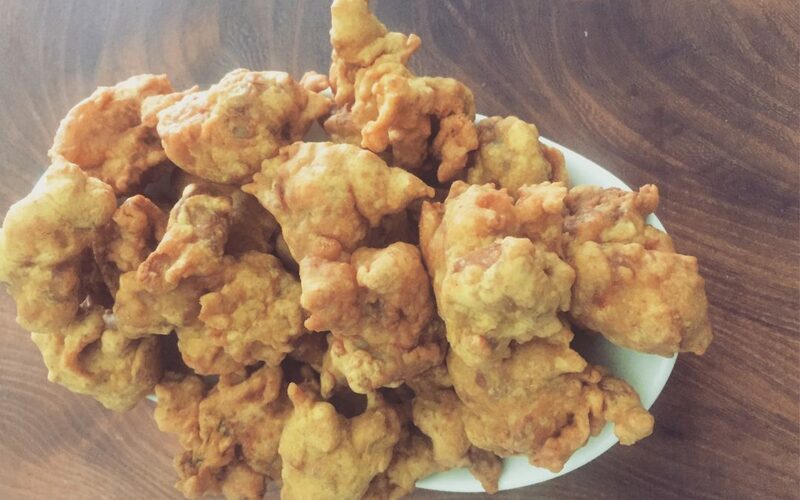 Fry for 7- 10 minutes in batches until all the chicken pakora have cooked. 6Serve the chicken pakoras with a variation of dips such as tamarind sauce, mint yoghurt, chilli and garlic or even ketchup.